Deluxe table top ironing board holds iron for you! Slide out the legs and iron away without hauling out the heavy full-size board. Store the iron between uses on the rack at the back of the compact ironing board. Generous 32" length and 12" width make it easy to press slacks, blouses, dinner napkins, doilies. Stands upright to 6" high. 100% cotton cover. No express shipping. If you have used a full ironing board in the past, this is very useful for people who have arthritis and cannot use the stairs. I will be able to use this on the table and also be able to take it with me when I travel in the car. Plus it is easy to store and lightweight too. So far I have no complaints about it. LESS REALLY IS MORE ! Believe it or not I love to iron. I find it relaxing. The only stress was when I had to pull out the "GIANT" ironing board. It took up too much space, then having to adjust it, always having to tighten the cover etc. . . This is the best for that quick touch up, yet I iron my sheets, pillow cases, duvet, easily. Even if you have a large family buy this in addition to your regular board as I know sometimes you need to iron 1 item (in a hurry) and this will save you time. The ironing board is easy to use because it is so light and portable. I can set it up on any flat surface in no time at all. I can iron my blouses and pants easily. One must be careful not to iron on the narrow end because it will dip down. Great for a small apartment. Love not having to get the big board out for touchups. This board works great but do to its light weight, it did move around on smooth surfaces, so I measured the diameter of the base tubing and went to a local hardware store and purchased some rubber tubing that would fit around the base tubing. I cut four pieces about two inches long, each, and slit the length of each piece and slid it over the base on each side, front and back, placing the slit on the top and put a piece of self-adhering rubber tape around the rubber tubing to keep it from coming loose. Just make certain that the tubing you purchase is not to small on the inside diameter or it won't fit around the the boards base tubing. For me, this solved my problem! I love this board because it is small and I am able to iron on my counter. I was very pleased with the design. It is not flimsy and the rack for the Iron to sit on comes in handy. The only thing I could think of to improve this item is it could use more padding. Other than that, I would give it a thumbs up because similar Ironing boards I have seen are going for a lot more money. The greatest thing about this ironing board is that I can set it up in a minute and it even has a holder to place my iron upon ! Love it ! It is a very nice product but it slids a lot on the table. I was hoping it would be very easy to use but at times like I said it does not stay put. Need it. Live in a condo. I love this small ironing board for all my sewing jobs. Absolutely love it. Perfect size for my small living quarters. Good price. 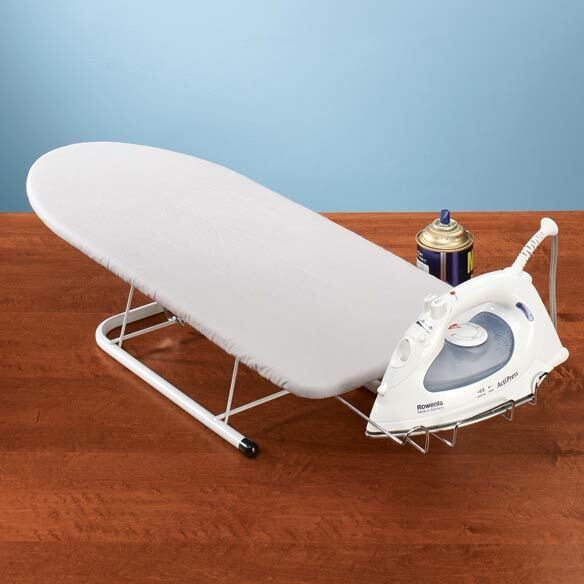 This table top ironing board is a fun way to finish up laundry! "I chose this Tabletop ironing board for my Mother to use in her assisted living apt. Its convenient and she can store it in the closet when not in use." To replace 57 year old ironing board; too big to store in tiny apt. for easy ironing any place within my home. I just bought an iron and needed the board. Having finding another model that does not have the stand this model does is inferior, this one looked more sturdy. I don't have the space for a huge ironing board and this seemed a suitable choice. Convenience. Place for iron. Use on any table. I had one of these at one time and it is very handy, easy to store and to use. I need this. Plus it has a stand. Lots of good reviews, and it is convenient. Needed a small ironing board and this looked like a good one. I don't iron often so this is handy. It is just what I need when I'm sewing. It makes it much easier for me to press and sew without putting up my large ironing board. I need an ironing board. easier to iron just one piece of clothing that needs pressing. Because I don't always want to lug out my big ironing board. This should be good for quick ironing. Convenience, I'll not have to handle the large ironing board. BEST ANSWER: Thank you for your question. This weighs 6.4 pounds. We hope this information will be of help to you.